NC P 6828702 Classic White Folding Shower Seat with legs only OUR PRICE £128.99!! 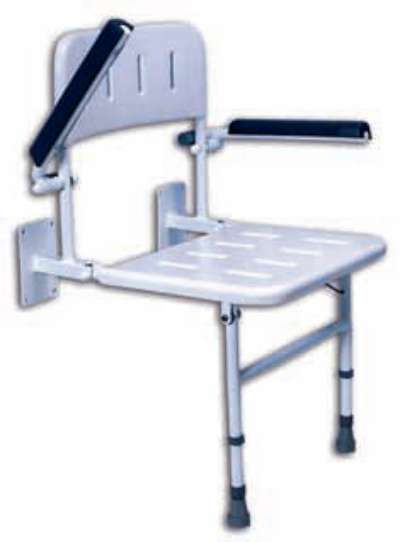 The seat is height adjustable enabling it to be set at various heights to suit the user. The legs have fine adjustments to compensate for any variation in the shower tray. 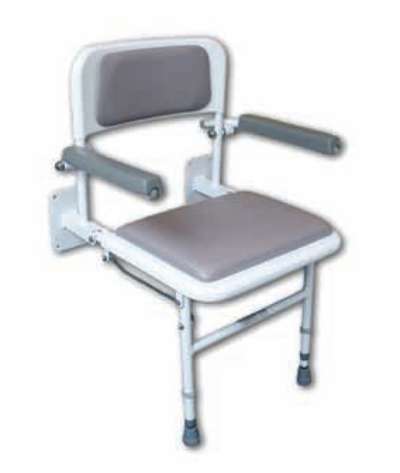 The frame is manufactured from rust free aluminium and the clip-on seat is injection moulded making it an excellent solution for long term maintenance free use. NC P 6828719 White Compact Folding Padded Shower Seat with legs only OUR PRICE £128.99!! The White Compact shower seat with legs, offers an ideal solution where installation space is limited. The seat also enjoys the benefit of having fine adjustment legs; it is also very easy to clean and has an integral anti-bacterial finish which resists 99.9% of bacteria including E.Coli and MRSA. NC P 6828700 Comfort Folding Grey Shower Seat with legs only OUR PRICE £139.99!! The grey padded seat is height adjustable enabling it to be set at various heights to suit the user. 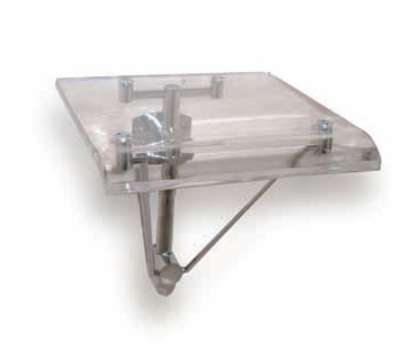 A fine adjustment leg is fitted to compensate for any variations in the shower tray. NC P 6828718 Grey Compact Folding Padded Shower Seat with legs only OUR PRICE £158.99!! The Grey Compact shower seat with legs, offers an ideal solution where installation space is limited. The seat also enjoys the benefit of having fine adjustment legs; it is also very easy to clean and has an integral anti-bacterial finish which resists 99.9% of bacteria including E.Coli and MRSA. NC P 6828693 Comfort Folding Blue Padded Horseshoe Shower Seat with legs only OUR PRICE £199.99!! 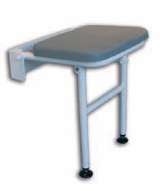 The comfort folding blue padded horseshoe shower seat offes the ideal solution where simple, hygienic personal bathing is required. The seat is height adjustable allowing it to be preset to suit users especially transferring from wheelchairs, this ergonomically designed seat is manufactured from high quality PU foam for improved comfort and softness and is detachable for ease of maintenance. 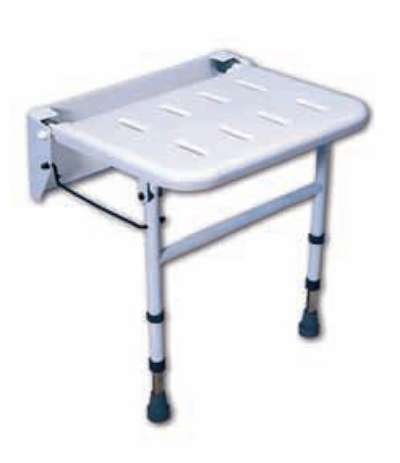 NC P 6828707 Classic White Folding Shower Seat with backrest, arms and legs OUR PRICE £248.99!! The classic white folding shower seat has proven to be one of the most popular shower seats available in the UK. The seat is height adjustable enabling it to be set at various heights to suit the user. 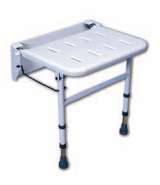 The legs have fine adjustments to compensate for any variations in the shower tray and the arms lift independantly enabling a safe and controlled transfer. 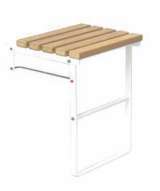 The white frame is manufactured from rust free aluminium and the clip-on seat is injection moulded making it an excellent solution for long term maintenance free use. The Clear Portia shower seat is a stunning contemporary design in perspex & chrome perfect for a drying area within any bathroom or wet room. 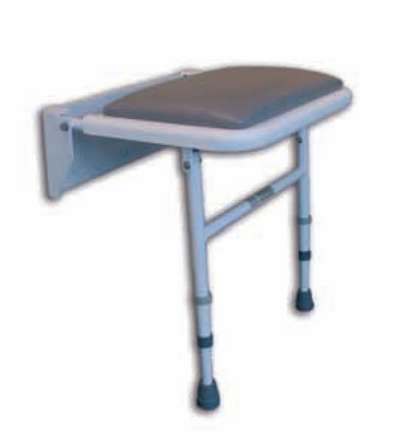 NC P 6828692 Comfort Folding Grey Padded Shower Seat with backrest, arms and legs OUR PRICE £289.99!! The comfort folding grey shower seat has proven to be one of the most popular shower seats available. The padded seat is height adjustable enabling it to be set at various heights to suit the user. A fine adjustment leg is fitted to compensate for any variations in the shower tray and the arms lift independantly enabling safe and controlled transfer. The frame is manufactured from rust free aluminium and the clip-on seat is injection moulded making this seat an excellent solution for long term maintenance free use. 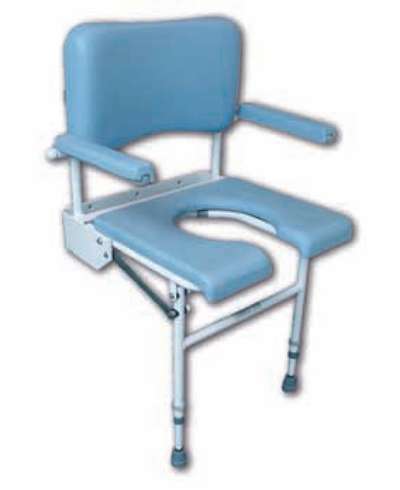 NC P 6828691 Dual Folding Blue Shower Seat with backrest, arms and legs OUR PRICE £359.99!! The dual folding blue shower seat features a unique 2 in 1 seat with a large removable cutaway for personal bathing. The large seat and back are generously padded for comfort and the arms fold independantly for ease of transfer. NC P 6826232 Black Lucia Folding Shower Seat without backrest OUR PRICE £389.99!! 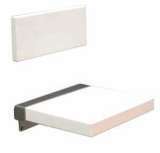 The Lucia seat is a luxury padded wall mounted fold down seat in PU and polished finish. 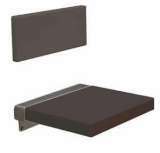 NC P 6826234 Brown Lucia Folding Shower Seat without backrest OUR PRICE £389.99!! NC P 6826228 White Lucia Folding Shower Seat without backrest OUR PRICE £398.99!! 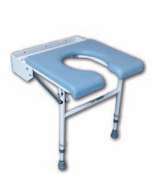 NC P 6828694 Comfort Folding Blue Padded Horseshoe Shower Seat with backrest, arms and legs OUR PRICE £419.99!! The Comfort folding blue padded horseshoe shower seat with back rest and arms is designed for hygienic personal bathing. It has the added benefits of an ergonomically designed padded back for improved comfort and independantly folding padded ams to improve user safety and aid transfer. Both the PU seat and back are detachable for improved cleaning and maintenance if required. NC P 6826229 White Lucia Folding Shower Seat with backrest OUR PRICE £589.99!! The Lucia seat is a luxury padded wall mounted fold down seat in PU and polished finish and is completed with a luxurious back rest. NC P 6826233 Black Lucia Folding Shower Seat with backrest OUR PRICE £589.99!! NC P 6826235 Brown Lucia Folding Shower Seat with backrest OUR PRICE £589.99!! The Wooden Broadgate folds neatly against the wall for storage and lets down securely for wheelchair or shower chair transferance. White frame finish with natural ash wood effect seat slats. 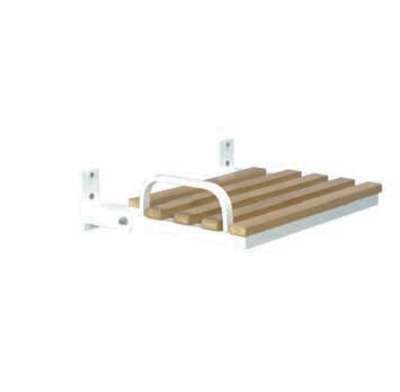 The Wooden European shower seat folds down from it's against the wall storage position to aid transferance. It is finished in natural ash wood effect seat slats. The simple but stylish white shower seat will complement any bathroom. 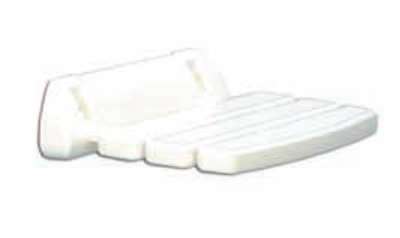 Suitable for domestic and other confined shower installations, made from white soft ABS plastic.